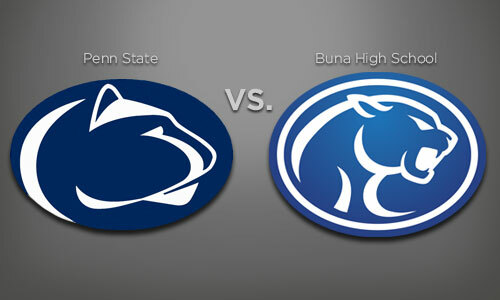 Like many high schools with little budget and no clue as to what institutes true trademark infringement, Buna High School in Buna, Texas had been “assured” by a local sportswear vendor that using this cool cougar image would be perfect and different enough than Penn State’s Nittany Lion logo that they would be safe in using it. 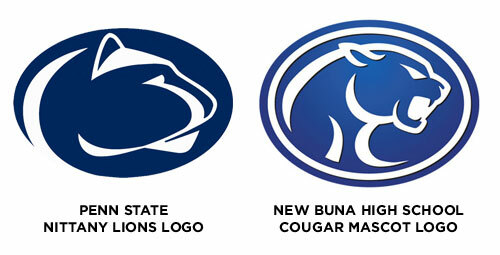 Not sure what alternate universe this sportswear vendor was in when they were viewing the Nittany Lions’ logo because it was a rip-off all the way to the same color, but I’m sure they felt some sense of protection in the relative obscurity of being a small high school in the middle of Texas (actually they’re closer to the coast, northeast of Houston) that no one would notice that they were using someone else’s registered trademark for their school mascot. 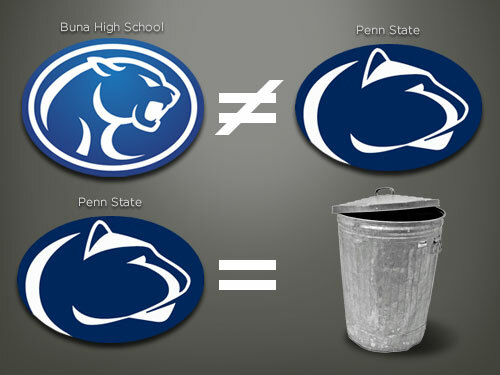 But…someone did, and that someone notified The Collegiate Licensing Company (CLC) in Atlanta, GA, who just happens to manage the licensing of trademarked merchandise for many high-profile NCAA schools and is also charged with enforcing the protection of the trademarked Nittany Lions logo of Penn State in particular. A curt Cease and Desist letter was promptly sent to the small high school with the requirement that they immediately remove the logo from all their uniforms, paint over walls with the logo and stop using the logo for any other printed material or clothing.